International football is out of the way for now as round three of the Spanish La Liga commences this Friday. Real Sociedad and Barcelona lead the standings tied on six points with a goal difference of (+4). Surprise-packages, Leganes, are third with six points to their name as well. Madrid giants, Atletico and Real, sit in fourth and fifth place respectively. But, it’s still early days, and a lot can change in the long run. Having said that, there is absolutely nothing wrong with bagging some early points. In-form Leganes kick-start the weekend off with a tough test, hosting Getafe on Friday night. The Lega faithful will be hoping for more of the same after getting their campaign off to a flyer, winning both their matches by a 1-0 scoreline. Getafe are yet to record a victory since returning to the top flight, drawing at Athletic Bilbao, before being humbled to a 1-0 defeat at home to Sevilla. Getafe haven’t found the back of the net, while the hosts are yet to concede. Back the home win and include in all multiples. Champions, Real Madrid, return to the Santiago Bernabeu after what was a fantastic international break for some Madrid players. Isco, Toni Kroos and Cristiano Ronaldo were all star-performers for their country, while the others had decent games too. Isco is finding the form of his life and is slowly sealing the lips of all his doubters. Levante are undefeated so far, however, they played both their matches at home. A trip to the Bernabeu might be too much to handle for the newly-promoted side. Back Madrid to Score In Both Halves at 3/10. Valencia and Atletico Madrid battle it out in what many consider to be the tie of the round. Both sides are unbeaten with four points each to their names. 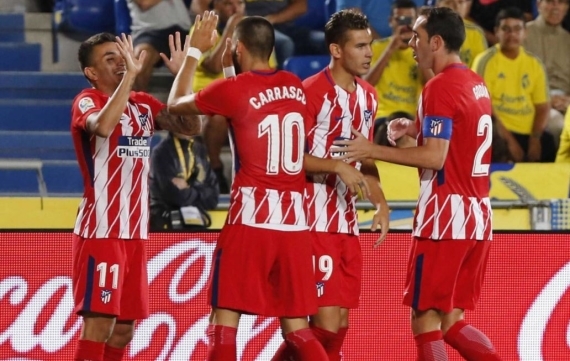 The Bats will be hoping to turn last season’s dismal performance around where they lost both matches to Atleti, 2-0 at home and 3-0 at the Vicente Calderon. Diego Simeone might rest a few players with the UEFA Champions League in the back of his mind. Valencia earned a commendable 2-2 draw away to Real Madrid before the international break and could spring an upset here again. Back Valencia on the Double Chance at 13/20. Sevilla host Eibar in what should be an eye-catching fixture. The hosts are one of the most free-flowing attacking teams in the country, while Jose Luis Mendilibar’s Eibar are one of the most resolute teams in defence. Since Eibar earned promotion in the 2014/15 season, Sevilla are yet to taste defeat from the Basque side. Sevilla, who also have a Champions League clash to worry about in midweek, could take their foot off the gas as they play Liverpool next Wednesday. As much as I’m a fan of Sevilla, my heart tells me that Eibar will get a point. Back the draw at 29/10. Saturday’s La Liga action ends with an exciting Catalonian Derby between Barcelona and Espanyol. Barca haven’t lost to Espanyol in the league since 2009, and that was when Seydou Keita got sent off in first half and Yaya Toure scored a consolation goal. Since then, Barca have enjoyed playing their crosstown rivals, smashing them a couple of times for four and even five. Espanyol are yet to claim a victory so far, while Barca are one of three teams to have a 100% record. Barcelona on the (-1) Handicap seems a great bet at 9/20. Deportivo face a stern test when they welcome free-scoring Real Sociedad to the Estadio Riazor. Pepe Mel did well to take over Depor and help them avoid relegation last season, but the way they started their 2017/18 campaign, suggests that they could be in for another dogfight. Sociedad have been brilliant in the early stages, leading the way with six points from their opening two matches. In both games played so far, Sociedad put three past their opponents. Juanmi and Willian Jose have got two goals apiece so far. My money is on the away win! Athletic Bilbao sit in the middle of the table with four points to their name, however, they are yet to concede this season. For those who follow La Liga closely, you’ll know that its same old, same old for Bilbao, with their famous 1-0 victories. Just two games into the season and Girona are already known as ‘that team that took a 2-0 lead against Atletico Madrid and fluffed it’. Still, the newly-promoted side have been decent, but, are yet to play away from home. Bilbao should come good here, despite having the UEFA Europa League to focus on next Thursday. Celta Vigo and Alaves will both be looking to get their first points of the campaign when they battle it out on Sunday evening. It’s been a disappointing start for both clubs who, in all fairness, are capable of a top half finish come May. This could be the perfect time for revenge as Celta were dumped out of the Copa del Rey by Alaves in the back end of last season. I’m expecting Celta to be much stronger with Turkish sensation, Emre Mor, in their squad. Back the home win at a decent price of 15/20. Villarreal have been disappointing so far, losing both their matches played. They’re also yet to find the back of the net. However, this is the Yellow Submarine’s first game at home and they could bounce back against Real Betis, who they did the double over last season. Betis lost their only away game so far, going down 2-0 to Barcelona, and I’m expecting more misery for them. With star players like Carlos Bacca, Enes Unal, Cedric Bakambu and Nicola Sansone, they should find their feet. Get on the hosts at 17/20! Round three of La Liga ends with Malaga hosting Las Palmas on Monday night. Neither side have been convincing as they’re both yet to register a point for the new season. Malaga have suffered two 1-0 defeats, while Las Palmas lost 1-0 to Valencia, and then 5-1 to Atletico Madrid. Malaga tend to raise their game for the giants, but against the so-called smaller teams, they fail to flourish. I can’t split these two sides here, making the draw my most likely outcome.